October 3rd, 2012 — M S International, Inc. (MSI), the leading importer and distributor of natural stone and porcelain has significantly expanded its operations in the Northeast. The newly constructed addition includes an additional 35,000 square feet of warehouse space dedicated to slab inventory. The slab distribution facility now totals 110,000 square feet. 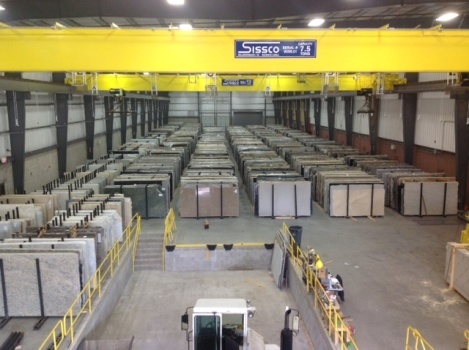 The expansion has allowed MSI to increase its stock to over 25,000 slabs of natural stone and quartz, encompassing 350 colors of granite, marble, quartz, onyx, and limestone. The expansion also includes upgraded showroom style lighting throughout the warehouse and a recently expanded 20,000 square foot customer viewing area. Founded in 1975, MSI is a leading distributor of flooring, countertops,decorative mosaics and wall tile, and landscaping products. Headquartered in Orange, California, MSI also maintains 20 distribution centers across the United States and Canada. MSI's product line includes granite, marble, travertine, slate, limestone and other natural stone products imported from over 36 countries on six continents. In addition, MSI carries an extensive offering of porcelain, ceramic, glass and quartz products. The company imports over 38,000 containers per year and maintains an inventory of over 125 million square feet. For more information on MSI, visit www.msisurfaces.com.